Raise your hand, if you please, if you feel upset at the sight of our countrymen trying to get on with their lives amidst murky floodwaters! These are people, mind! People! Not fish! Not amphibians! People! And we see videos of their miserable lives each and every godforsaken night on the evening news! They complain a little; they shed a tear or two; but mostly they go on with their daily lives under next-to-impossible conditions. When the news crews come, they smile and wave at the video cameras. That is what and who we Filipinos are as a people. We resign ourselves to the worst that Mother Nature can serve and look forward to the next day with smiles on our faces. We are nothing if not resilient! Yet, when you come to think about it, does it have to be this way? Rain is supposed to be a mundane occurrence in the part of the world that we live in; and one only needs to visualize the vast Sahara to understand what life will be like without it. It has, however, come to the point when the prospect of rain has become something that is already being feared. The principle regarding water is remarkably simple. If allowed to flow, it will find its way to the lowest ground and out into the oceans. That is why there are creeks and rivers; and they all lead into the oceans. If water spills from its normal channels, then it can only be from either of two reasons. First, there is an awful lot of it being dumped from somewhere; and second, it is not being allowed to flow as it wishes to. It is foolhardy to think that the one can do an awful lot in terms of attempting to control what Nature wishes to serve. Thus, it is stupid to say the least to blame the climate and weather, global warming or otherwise. In this part of the world where we live, that it will rain at this time of the year is as certain as the fact that we live and breathe. On the other hand, there is an awful lot that can be done to give water the freedom to go where it wishes to go. Foremost among these is to keep its normal channels unobstructed. Siltation is a natural phenomenon that occurs as soil is eroded in higher ground by rushing waters and deposited downstream into rivers and their mouths. That is why there are dredging machines to free rivers of deposited sediment. 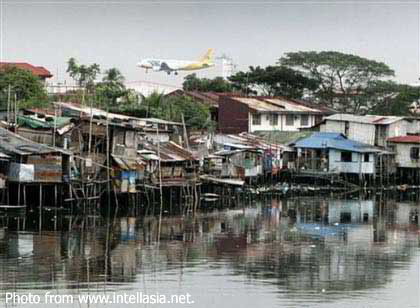 In our case – and especially so in Metro Manila – the normal channels for water to run into are blocked in some cases by ill-advised man-made structures or by illegal settlements and the tons of garbage mindlessly discarded by these settlers on these channels, i.e. rivers and creeks. That is why I am a hundred per cent behind the President on his call for the easement law to be enforced. In a nutshell, the law is a legal recognition of water’s right to seek lower ground unimpeded. Its enforcement means the removal of impediments which means in some cases the demolition or removal of settlements along rivers and creeks which encroach upon the stipulated three metre clearance. I am not being anti-poor. Law, however, cannot be selectively enforced. For example, homeowners in Lipa – including this writer – who live along the national highway have had to cede portions of land to government due to the right of way law that has been cited for the road widening project. Mind, the land that government took without reimbursement is privately-owned land. By and large, homeowners simply acceded as an acknowledgment of government’s authority and with the belief that the project is for the greater good. In the case of the illegal settlers along river embankments, why do you think are they called illegal? Does being poor exempt them from law enforcement? They do not even have a right to be there; and it is no secret that they have turned creeks and rivers into not only garbage receptacles but also sewer systems. One such settler was interviewed by a news reporter last night and said that relocation was out of the question because that would take them away from their sources of livelihood. Please! The poor have to be educated and provided with opportunities; not spoiled to the point that they actually can afford to be choosy! To get back to the matter of flooding, the clearing of easements is the first step; and every other thing that needs to be done also needs political will. Serious political will, that is! People have been fighting to stave off floods since ancient times; and so it is foolhardy to think that no solution can be found. To do so, levees and dikes have been built; man-made water channels called floodways have been constructed; retention ponds to hold extra water have been dug; gigantic gates have been erected to keep out the tides. It is not, therefore, as though there is no technology to defend against water. The Dutch, for instance, have been keeping out the seas for centuries! 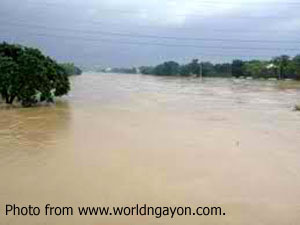 In the Philippines, defending against floods using the aforementioned methods will mean not only relocating the illegal settlers but also – in constructing floodways – infringing on private properties. This is where serious political will is necessary because it is inevitable that there will be some very influential landowners along the way. Whatever flood defences are put in place will also entail a lot of money. That said, the alternative is just as expensive. 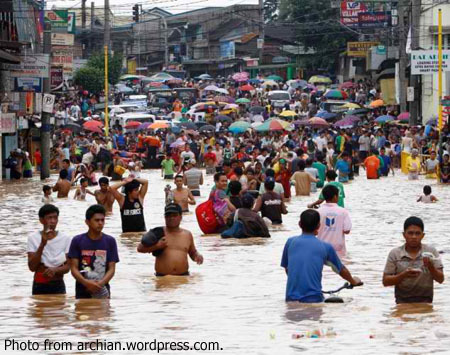 Everything has a cost, actual or imputed: damaged properties and infrastructures; repair of these; lost manpower hours; rescue efforts; relief goods; and countless others. Add to these the psychological and sociological toll on the people. Even if flood defences are constructed, it has to be said that Nature does have this nasty habit of having its way. In fact, floods are as wont to happen in advanced countries as they are in countries such as ours. That said, flood defences limit the scale of catastrophes as opposed to these simply becoming a way of life. In the old days, people were alarmed by the arrival of typhoons; and understandably so because then, winds were feared more than the rains that typhoons brought with them. These days, people fear your mundane afternoon tropical downpour. Do we really want this? My greatest fear is that a spell of good weather will spoil whatever political resolve there is to solve once and for all the problem of flooding. Procrastination, after all, is also a national trait. There were severe floods back when I was in high school in the early seventies; so one would have thought somebody ought to have found a solution in the next forty years.